Almost every Windows-user will be familiar with Minesweeper, a simplistic, yet surprisingly addictive game that launched back in 1990. It became a standard feature in the operative system Windows 3.1. That's how most people came in contact with Minesweeper. It quickly became the perfect solution to waste time during a boring workday. Minesweeper was coded by Curt Johnson and Robert Donner. The player starts with an empty field of squares. Underneath each square there's a mine, a number or nothing at all. If a square contains a number, that number is the amount of adjacent mines to that particular square. 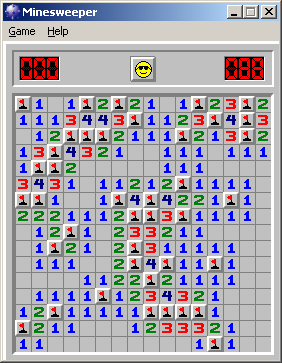 If the player picks a square with a mine, it's game over. The goal is to clear the entire field and mark all mine-squares by placing a flag on them. Not much has changed with Minesweeper over the years. Microsoft has given it a few tweaks, especially graphical ones, but the overall concept hasn't changed over the decades. Like many games included in Windows, Microsoft had a hidden agenda with Minesweeper. Up until Windows 3.1 most people were used to text-based computing. A good example is how MS DOS was used. With Minesweeper came a golden opportunity to educate new users of the computer mouse. Since left-clicking and right-clicking has different functions it made people more comfortable with something that was new at the time. In 2001 there was a group calling themselves "International Campaign to Ban Winmine" that wanted Minesweeper out of Windows. The argument was that mines are a threat in many conflict zones and a symbol of suffering. For Windows Vista, Microsoft decided to offer alternative tilesets where flowers could replace the mines.